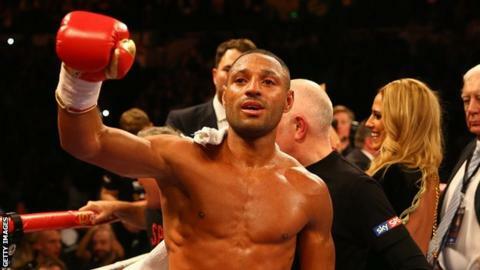 Britain's Kell Brook is hopeful of meeting the winner of the super-fight between Floyd Mayweather and Manny Pacquiao, which takes place on 2 May. Mayweather (WBC and WBA) and Pacquiao (WBO) own three-quarters of the recognised welterweight world titles, while Brook is the IBF title-holder. The fight between Mayweather and Pacquiao will be the richest ever. "They've got enough money, so it's not about money for them, it's about legacy now," Brook told BBC Sport. "I've got a welterweight world title, Manny Pacquiao and Floyd Mayweather have the rest. "They'll want to sail into the sunset with all the belts, I'm available for a unification fight, so absolutely there's a chance of me fighting the winner. "It's a short-lived career and you want to fight the best in the world." Sheffield's Brook, 28, is undefeated in 34 professional contests and has made one defence of his IBF title, which he won from American Shawn Porter last August. His next defence will be against Birmingham's former world amateur champion Frankie Gavin, in London on 30 May. Brook believes American legend Mayweather will defeat Pacquiao, although he expects the Philippine great to run him close. "Manny Pacquiao is an unbelievable fighter and there will be drama, but I've got to favour Floyd Mayweather," said Brook. "Pacquiao is a southpaw and southpaw opponents are more awkward than orthodox opponents. Manny also chucks a lot of shots and comes from awkward angles, which Mayweather won't be used to. "Pacquiao is a very active fighter, he'll pressure Mayweather and make him uncomfortable. "Mayweather will try to counter him while he's throwing shots, so it will be a chess match. But Mayweather is just too clever, his defence is great and he'll find a way to win. "It's got points written all over it, although if Manny thinks he's losing the fight and starts getting desperate late on, I can see him getting knocked out."